Check out this custom 2 BR, 1.5 BA full log home with 53+/- acres and over 4, 000&apos; of frontage on private, secluded Lake Sixteen, with no public access! This home offers an open kitchen, dining, and living room with panoramic lake views and field stone fireplace that will keep you warm and cozy on those cool nights. Recent improvements include a newer furnace with central air, garage door opener and re-stained in fall of 2017. There is a 2 car attached garage and pond dug in 2012. This property is ideal for those looking to utilize this property for its hunting and recreational potential and privacy, (there are no other homes on the lake), or for investors looking to develop or subdivide. Here, wildlife abounds, with deer and turkeys in the back yard, geese, ducks and loons on the lake and Eagles nesting on the nearby island. 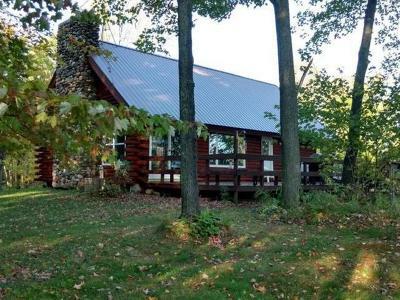 This property offers an ideal location just down the road from Lake Ten, Spring Creek Wildlife Refuge, and 26, 000 acres of Price County Forest.